Established in 1997, we provide the oil and gas, power generation, chemical, paper and pulp, petrochemical and process industries with a UK manufacturer of significant expertise and experience in the field of control and choke valves. In 2000 Valve Solutions formulated a joint working agreement and technical collaboration responsibility with Pneucon Valves for the manufacture of globe, angle and 3-way control valves for standard and medium service control valves up to 300mm NB and ANSI class 900. In 2000 Valve Solutions formulated a joint working agreement with Mitech SA to undertake manufacture of globe and angle control and choke valves for severe service control valves up to 400mm NB and ANSI class 4500. In February 2002 Valve Solutions was awarded ISO 9001:2000 by QMS. In 2002 Pneucon Valves (Pvte) (Valve Solutions manufacturing partner) were certified to issue PED certificate of conformity to module H.
In 2003 Valve Solutions were awarded ISO 14001:1996 by QMS. In 2003 Valve Solutions supplied 16" ANSI 4500 angle valve with severe service trim design to Sulzer Pumps. This valve was capable of handling a pressure drop across the valve from 850 to 2 bar with a flow of 2000 m3/hr. In 2003 Valve Solutions extended the technical and manufacturing capability of Pneucon Valves (Pvte) Limited up to 600mm and ANSI class 2500. In 2003 Valve Solutions provided 450mm severe service control valve to Centrica Storage for use as an anti-surge control valve to replace existing control valve design which had caused major operational issues. In 2004 Valve Solutions Limited supplied 400mm control valve to BP Petroleum for use on Schehallion offshore facility. In 2005 Valve Solutions were certified to issue ATEX certificate of conformities in accordance with European legislation. In 2006 Valve Solutions purchased a 3D modelling program to enhance its design capability. In 2007 Valve Solutions provided 2 off 600mm globe control valves fitted with severe service trim designs to Sulzer pumps. In 2008 Sulzer Pumps awarded Valve Solutions the contract for the supply and support of Valves for all Sulzer Pump test facilities. In 2008 Valve Solutions were awarded the contract by Alstom Power to supply 17 Control Valves to Grain PS project which included 12 off 14" globe style control valves. In 2009 Valve Solutions designed, CFD modelled and manufactured a new severe service multi turn multi stage trim design. 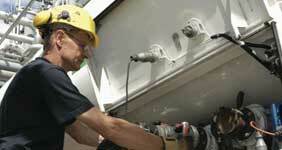 In 2009 Valve solutions was awarded ISO:9001:2008 by Lloyds Register. Valve Solutions Three Way Globe control valves are used to combine two flows or to divert one flow into two outlets. The Series 170 Control Valve product range emulates the Series 110 design except that the valve body is an angle type constitution instead of a globe style. Our company aim is to provide control valve solutions at a competitive price within the required delivery schedule, to customers technical and quality requirements. Established in 1997 Valve Solutions has over 80 years collective senior corporate experience in the control valve industry. 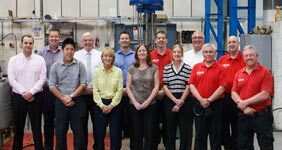 With over 13 employees, including chartered and graduate engineers, ready and able to solve the diverse problems associated with high pressure, high flow, low noise and abrasion resistant valves, for both control, choke and other related applications.